The everyday moments that we spend exploring the world with our families with favorite movies, shows, and games bring us some of the most precious moments life has to offer. 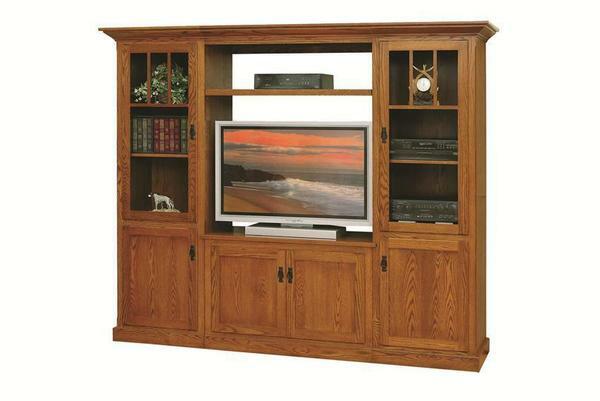 These beautiful experiences bring definition and meaning to our down-time - and this Mission Classic Entertainent Center, handcrafted from solid wood in a traditional Amish woodshop in the northern United States, offers a perfect way to make those moments even more of a part of the family home. Your Mission Classic Entertainment Center will be handcrafted from fine American materials in a small woodshop in the United States. This means that if you need any custom changes - from dimensions, to look, to features - our woodworkers are ideally positioned to bring those unique changes to life. They love a challenge just as much as we do, so if you have any queries at all, please don't hesitate to get in touch by phone or by email. Height of Bottom Center: 28.5"
Customizations available. Also available in Shaker and Amish Country style.